A little over a month ago, Quicken made Quicken Online free for everybody who wants to use it. Quicken Online is a online tool that allows you to perform some basic money management functions such as tracking you expenses, making a budget, reminding you unpaid bills and checking your financial goals, etc. I have been using a stand alone version of Quicken for years and feel it’s a quite convenient tool, though I only use it to track my investments. What’s left until your next paycheck: Now Quicken online can show you how much you still have in your account before your next payday. It can also give your a visual forecast of how your balance will go up and down day by day. How your bills affect your balance: Quicken Online can also remind you how much time you still have before a bill is due. 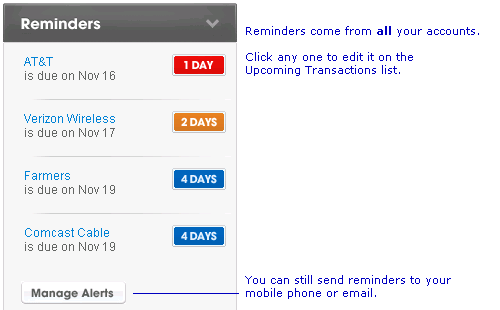 This new feature shows you alerts for all your linked account, with one reminder for each account. With this feature, you easily see all the bills that need to be paid soon. I wrote a short Quicken Online review before. If you are not familiar with the tool, check out the new Quicken Online demo video to get an idea of the tool and the new features. Hi there! Thanks for mentioning the newly redesigned Quicken Online. I appreciate your feedback. If you’d be interested in a one-on-one to learn more about the features and changes, please contact me directly.